Why do we need Humane Conservation certification? Read our white paper to find out. In contrast, American Humane’s new Humane Conservation program offers an improved model that allows for independent, third-party certification of the humane treatment of animals in human care, based on rigorous science and evidence-based practices. Humane Conservation audit teams are independent from the institution, and the focus is solely on the humane treatment of the animals, and not other factors outside of animal welfare. With more and more Americans concerned about the treatment of animals, Humane Conservation certification standards are 100 percent focused on animal welfare, and have been developed by leading scientists and ethicists. 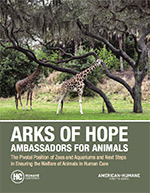 It is the first program of its kind —the new gold standard for animals in zoos, aquariums and in human care.